Uvas Pines – Where the quiet life awaits you! 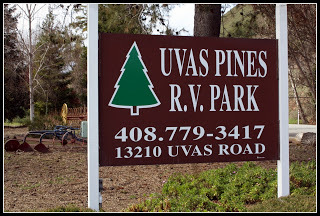 Uvas Pines RV Park, of Santa Clara County, California, is nestled in the beautiful western foothills of Morgan Hill, in an oak tree studded valley with a picturesque creek and nearby vineyards. Uvas Pines is just a short distance from the heart of Silicon Valley with easy access to San Jose, San Francisco, Palo Alto, Monterey, Carmel, Pebble Beach and Santa Cruz. It is only minutes away from all major shopping. The Park has extra wide paved and level spaces for drive through and back-ins able to handle any size motor home or RV. If you need assistance, our friendly staff will be there to help. Plenty of room between spaces for your pop outs, canopies and personal vehicle without bothering your neighbor. The park is spacious and free from the dreaded freeway or railroad noise. The park offers free wireless internet access, laundry rooms, hot showers, propane, fax machine service, plenty of parking, hiking trails, creekside picnic areas and a friendly staff . Motor in for the day for a relaxing stay!